We’ve been on the move pretty much since Dec. 20. We ended our month-long residency in the 5th floor apartment in Prague and started to take little bites of Europe as we made our way, ultimately, to Turin, Italy where we are now and will remain for a few days before starting back to Prague for the rest of our adventure. With our travel schedule and varying degrees of internet access it’s been difficult to keep the blog updated, but I’ve definitely been taking lots of photos, and it’s time to work through the backlog. Today’s account features to Czech cities: Cesky Krumlov and Ceske Budojovice. I like hats, but most hats don’t like me. That is, most hats aren’t a good look with my over-large jug. Broad-brim fedoras work well; and I can get by with a flat cabbie-cap, but ball caps, stocking caps, Panamas, Trilbys, pork-pies – all pretty much end up looking like a wart on a pumpkin when I put them on. 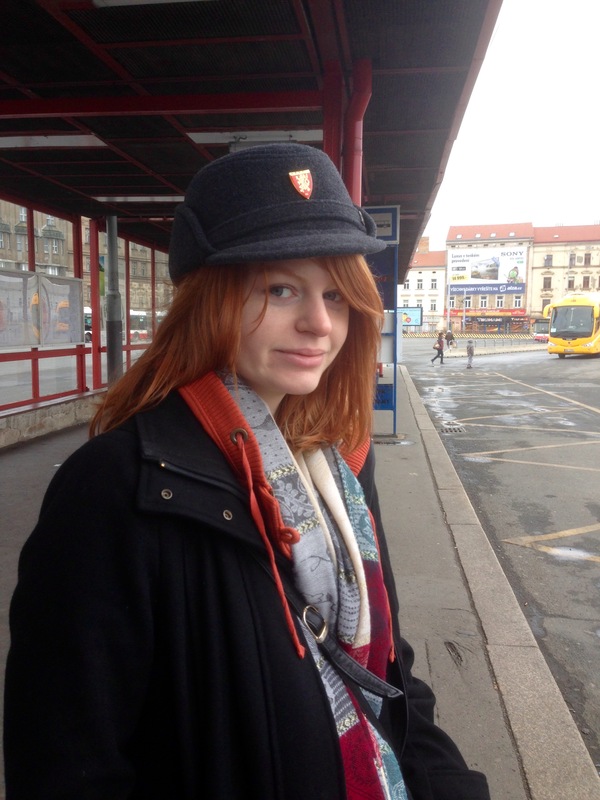 One of our first days in Prague, though, I saw an older guy wearing a boiled-wool hat like the one above, and I immediately thought that that style could work for me – and keep my ears warm. It took awhile to find one (I don’t know what the style is called) but I found this one in a Christmas Market in Prague, and they even had one my size. I scouted around another day or two to find the jaunty red pin like I had imagined in my mind’s eye. Both of my daughters, however, have heads for hats; just about anything they put on looks good – even my over-sized ones. This hat is no exception. When I said I’d bought a new hat, Tiger Lilly gave an “Oh, Lord” roll of the eyes. When she saw it, though, she said, “Hey!” and put it on, and it looked so good on her that I almost didn’t want to wear it again. 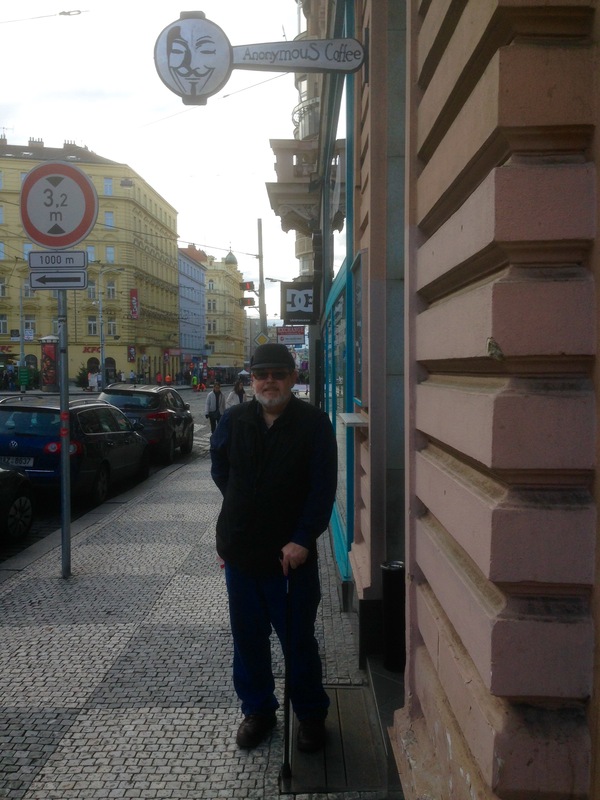 You can see what I mean in the photo, taken at the Prague bus station as we waited for our ride to Ceske Budejovice. When she posed for this on a gray day, the surroundings and the history I’ve felt here in the Czech Republic suddenly reminded of the old Elton John song, “Nikita”, from 1985. It’s actually a fairly mediocre video – not to mention that it gave people the impression that Nikita is a woman’s name (not the case in Russia), but it’s evocative of the last stages of the Cold War. The weather has actually been warmer than usual here, but if I have to war with the cold this winter, I’m ready. 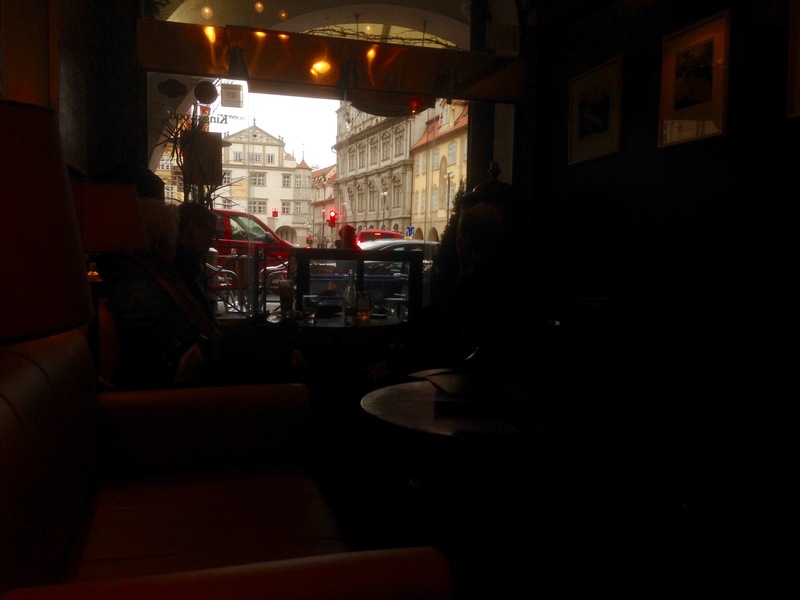 The first and longest part of our stay in Prague is almost over. On Sunday we’ll start off on a southerly sojourn through Austria and Italy before taking up residence again in Prague in early January. Before we start the next leg of our trip I thought I’d tie-up some random notes and observations from the past month. The trams, or streetcars, are plentiful here and the system works pretty well. It takes a bit of effort to get the feel for the map (and the language) as I’ve shared before, but these are the easiest way to get around, with the three Metro (subway) lines being your best bet for covering longer distances in the city. On the streets, the trams have undisputed right of way everywhere they go. As a driver or pedestrian you could dispute it, I suppose, but the physics really aren’t in your favor. An interesting thing, though, is that the trams, which run on rails embedded in the cobblestones and asphalt streets, don’t use bells and lights to announce themselves at stops. They show up without fanfare, in front of an audience that is expecting them. Contrast this to the Twin Cities where the light-rail trains have all the bells and whistles when stopping or pulling away – and yet some folks there lately seem to find it hard to keep from getting hit by these. Personally, I like the quieter approach. There’s a tram line about 100 feet from our apartment where I “work from home” each day. Trams pass by about every 10 minutes, and from the fifth floor I find the rumble actually kind of comforting. 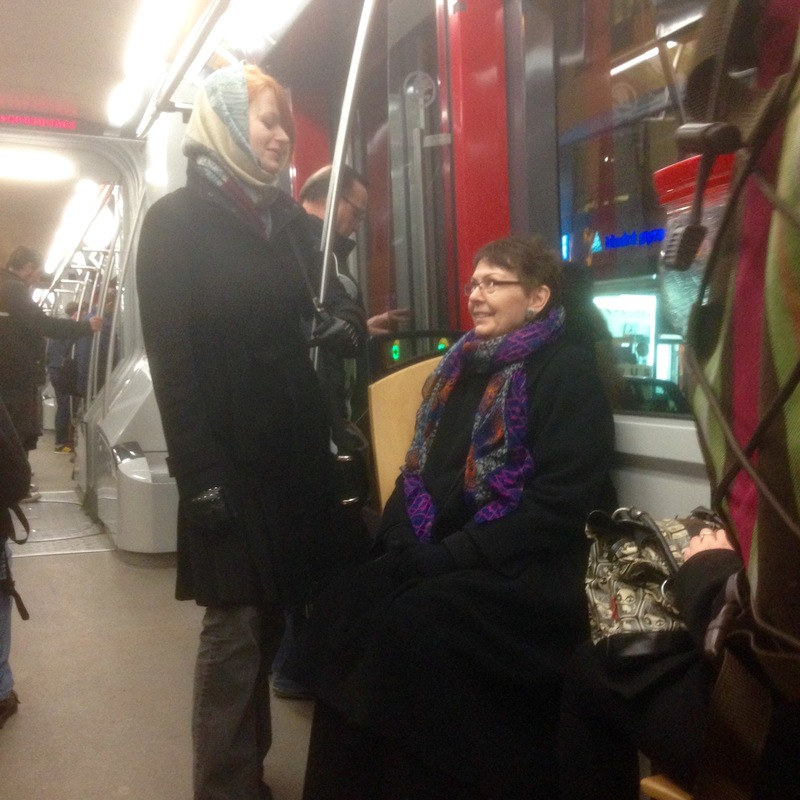 Will I see you tonight, on a downtown tram? If you really want a sense of power, though, you just need to be a pedestrian. The drivers here are conditioned to give pedestrians all kinds of room. The law, in fact, is pretty strict: failure to give right of way to pedestrians will get you 4 points on your license and a fine of 2500 to 5000 Kc (about $100 to $200). If you accumulate 12 points in a year you lose your license for at least a year. There are times when I’ll approach a “zebra” crossing on the street and will pause while still on the sidewalk to let an approaching car go by – only to see the car come to a stop in the middle of the street to let me pass, and all without a shaking a fist or flying a finger at me. Next to having people jump up and offer me (and my cane) a seat on the tram or subway, this is the most amazing thing I’ve seen over here. Speeding can get you 5 points and a 5,000 to 10,000 Kc fine, but if you really want to get in trouble just drink and drive. The acceptable blood-alcohol level here is ZERO. As in 0.0. If you have from .1 to .3 percent alcohol per millilitre BAC (which is, I think, essentially what you get from cough syrup) you get docked 3 points and have to pay 10,000 to 20,000 Kc. Go over the.3 threshold and its 6 points and the same fine, but you also risk losing your driving privileges for a year, regardless of points. Refuse to take the BAC test and it’s a 7 point charge and a 25,000 to 50,000 Kc fine. Perhaps the drivers are all so careful around pedestrians because they realize that if anyone on the streets is drunk it’s likely the person on foot! While the policie cast a hard eye on driving infractions, the Czech Republic is pretty laid back about gun ownership. They don’t have a Second Amendment here; gun ownership is as mundane a right as owning any type of property, and if you are a citizen and can pass a background and proficiency test similar to those in Minnesota, as well as a medical exam, you can get a permit that both allows you to purchase a gun or guns, and to carry them around with you. A reported 48% of the population have these permits. The deaths from guns ratio is at 2.0 per 100,000; not the lowest in Europe where many countries prohibit private ownership (but lower than Switzerland and France), but hardly blood running in the streets. The permits are good for 10 years, but there has been talk in Parliament of reducing this to 5 years. The Czechs actually have a very long tradition of owning firearms, going back to the 1400s when the Hussites defended their religious freedom (very effectively) against the Pope through the use of firearms. The Czechs are actually credited with coining the word “pistol” (pistala) in those days, which roughly translates as “hand cannon”. There are only two times in history where private gun ownership has been forbidden here: under the Nazis in WWII and under the Communists until 1989. Folks here still remember the yoke of Communism on their necks and in their living rooms, and since the 1989 Velvet Revolution their laws and outlook have been strongly in favor of personal liberty. You can see it most obviously in the bars and restaurants, which are usually full of cigarette smoke. Calls for laws to ban smoking have been repeatedly shot down over the years (not necessarily by the gun owners) but they keep coming back. Editorials this week have been supporting these laws and railing against “the tyranny of private interests over the good of the public.” No doubt for the children. Similar bills are in the works to limit the types of fuel you can use to heat your home, and to give the government more latitude in monitoring all electronic transactions. Even if they’re a bit smoky, the restaurants are good here (and there are often “no-smoking” sections for those who choose). We haven’t had a bad or indifferent experience, food-wise, since we’ve been here. Everything has been tasty and usually pretty affordable. Even the nicest places we’ve eaten at have been priced at about what we’d spend in the U.S., while we often find good food at great prices. The other day my wife and I stopped for lunch at a place near our apartment. Their lunch specials were a 3-course meal: two fried cutlets, boiled potatoes and coleslaw salad for me; grilled tenderloin medallions, fried potatoes and slaw for her – for just under 200 Kc each ($8). On top of that, the delis, bakeries and coffee shops have been fabulous and also affordable. 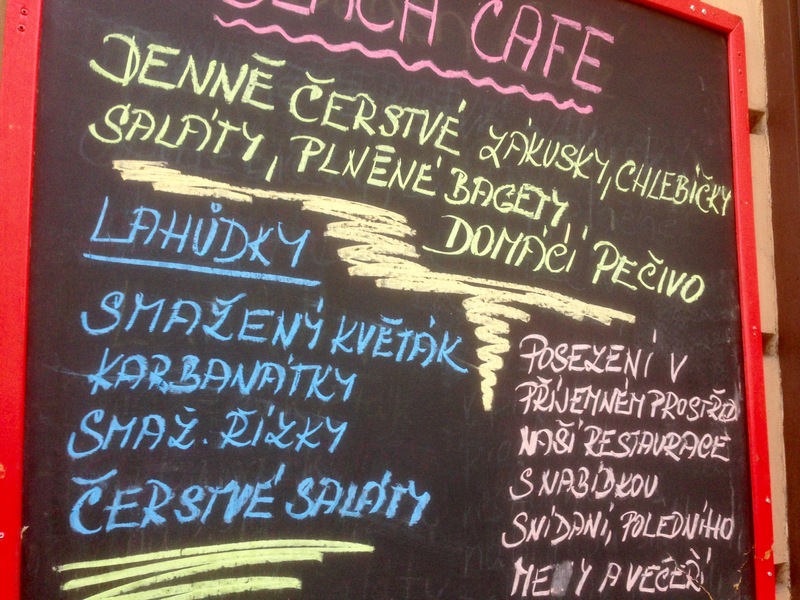 When Tiger Lilly did her research on cost of living, she wasn’t wrong about the Czech Republic. Excuse me, where was I? Oh well, you might not be able to spell or pronounce it over here, but if you can get it into your mouth you’ll be very happy. An article last week in the local English-language newspaper cited a study showing that Czechs are among the least generous, least helpful and least likely to volunteer among all the peoples of the world. (No. 1 in all these categories was Myanmar, FYI. The U.S. is typically second or third in these rankings). This is not to say that the Czechs are hostile or unusually rude; just exceedingly indifferent. As good as the food and prices are in the restaurants, for example, you’re not likely to find a waiter or waitress who cares much about your experience (except the guy who served us today at the Italian place, but I think he may have been the owner). Again, they’re not going to spit in your food, or shove it at you, but they’ll disappear for long stretches of time, which is a problem if you want to order another drink or even pay your bill. Restaurant service is just a small sample, of course, but it was interesting to read the findings of the global survey. I really don’t have a handle on why this is; if it’s a cultural hangover from the post-war era or what. Certainly the drivers and tram riders are quick to conform to certain standards, but whether out of courtesy or fear of large fines, I don’t know. I suspect it will take a long time of living here and talking to people to gain any real insight. For now, then, I just note it and move on. The country has been adamant about not taking in refugees, and the Czech president, Milos Zeman, has been very outspoken about it. The country did agree to take in some refugees, but only Christian ones. (Even as another study shows the Czech Republic as the most atheistic in Europe. I do have some thoughts on what is behind that, which I’ll share in a later post that I’ve been working on for some time). Anyway, we’ll be leaving Prague on Sunday. First we’re heading to a lovely spot in southern part of the country. I’d type the name, but it’s one of those that WordPress can’t comprehend the alphabet. We’ve been referring to the place as “Beetlejuice” between ourselves. We’ll move on from there to Graz and then to Trieste for Christmas. Then we’ll stop in Verona on our way to Turin where we’ll spend the week around New Year’s. When we return to Prague we’ll move into a roomy, remodeled attic – that features an elevator! The Reverend Mother, btw, found a GREAT room for Tiger Lilly to rent. It’s a 16 x 16′ private room in a larger apartment, about one block from Wenceslas Square. She has a view of the Museum out one window and a private, tended garden out of another, and it’s just within her budget. I’m sure she’ll share more details at some point, once she finishes her program. Her certification course has been very intensive and eats up nearly every moment of her free time. Getting out of town is going to be good for all of us! “But, I like it,” I’ll say, in a small voice. The upshot of which is that I’m over here in Europe with few presentable garments for my upper body – and no gypsy tent-makers in sight. This might explain why my wife is so content to leave me in my tower rather than have me mingle with the public. The thing is, as I get more accustomed to the stairs, I really like getting out on the streets of Prague – especially if I’ve been cooped up in the apartment for a couple of days. Last night when we hit the streets (under cover of darkness) I felt like a puppy turned loose in the yard, eager to sniff everything. While we were out we noticed a clothing store near the apartment, and a visit there made a good excuse for getting out at lunchtime today to see what they might have in my size. 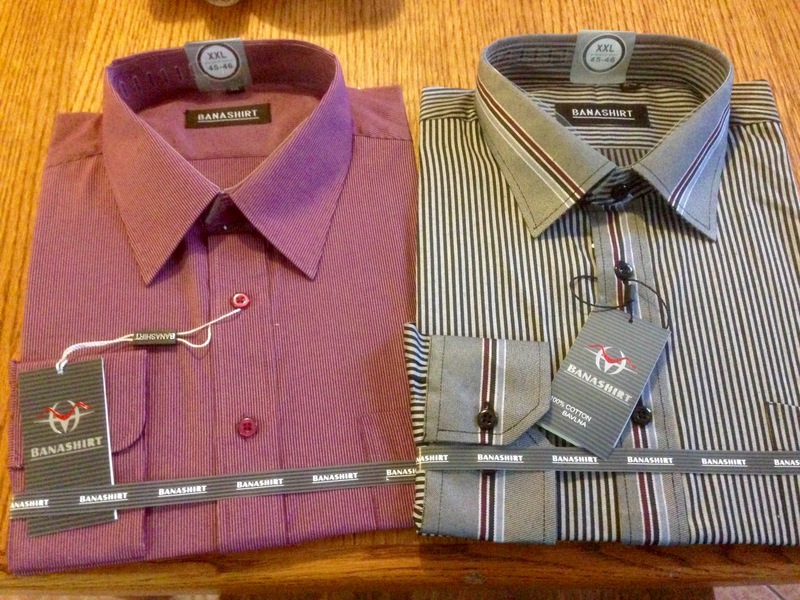 I scored two nice-looking cotton shirts for 200 krona (about $8) each, and my wife picked up some sweaters at a similar price. That mission accomplished we went to lunch at a place called Polévky, which means “Soups”. (I wonder if they’ve trademarked that)? The Reverend Mother and Tiger Lilly discovered this place the first week we were here, and they make a great chicken and tarragon soup in a tomato base. I got mine with a big wedge of bread, about the size of a large pizza slice, filled with cheese. The first soup is the chicken and tarragon; very savory! 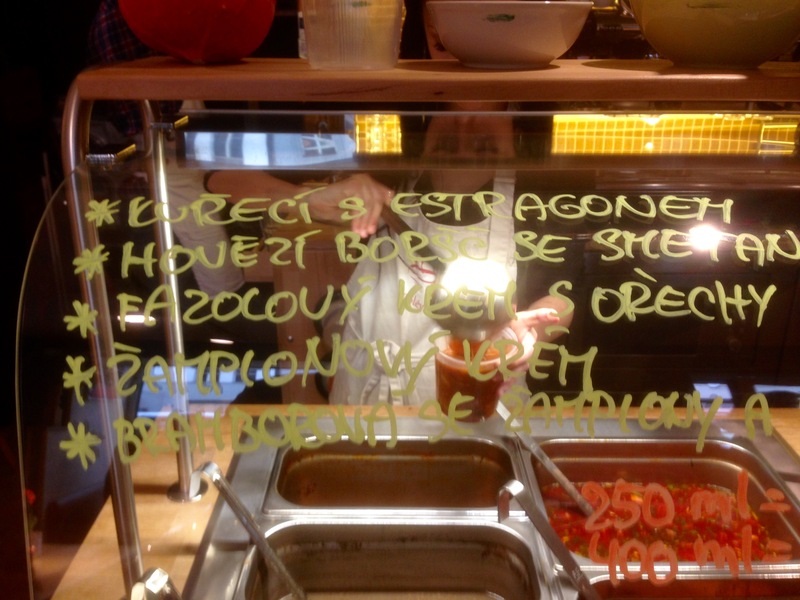 The other soups are, roughly translated, “beef in cream”, “bean and nuts in cream”, “cream of mushroom” and “potatoes and mushrooms”. There is another cafe close by as well, “The Beach Cafe” that I’m going to try. The lettering on the window invites you to “sit in their pleasant surroundings” and they offer “daily breads”, stuffed baguettes, cutlets and…oh, ick…fried cauliflower. Sometimes you’ve got to live dangerously when you’re on the streets.